Edward Robinson (April 10, 1794 – January 27, 1863) was an American biblical scholar. He studied in the United States and Germany, a center of biblical scholarship and exploration of the Bible as history. He translated scriptural works from classical languages, as well as German translations. His Greek and English Lexicon of the New Testament (1836; last revision, 1850) became a standard authority in the United States, and was reprinted several times in Great Britain. His magnum opus, Biblical Researches in Palestine, the first major work in Biblical Geography and Biblical Archaeology and conducted in the Ottoman-ruled Palestine region in the late 1830s and 1850s, earned him the epithets "Father of Biblical Geography" and "Founder of Modern Palestinology." Robinson was born in Southington, Connecticut, and raised on a farm. His father was a minister in the Congregational Church of the town for four decades. The younger Robinson taught at schools in East Haven and Farmington in 1810–11 to earn money for college. He attended Hamilton College, in Clinton, New York, where his maternal uncle, Seth Norton, was a professor. He graduated in 1816. In 1821 he went to Andover, Massachusetts, where he published his translation of books i–ix, xviii and xix of the Iliad. There he aided Moses Stuart in the preparation of the second edition (1823) of the latter's Hebrew Grammar. He translated into English (1825) Wahl's Clavis Philologica Novi Testamenti. Robinson went to Europe to study ancient languages, largely in Halle and Berlin (1826–30). While in Halle, in 1828 he married the German writer Therese Albertine Luise. After the couple returned to the United States, Robinson was appointed professor extraordinary of sacred literature at Andover Theological Seminary (1830–33). Robinson founded the Biblical Repository (1831), which he edited for four years. He also established the Bibliotheca Sacra (1843), into which was merged the Biblical Repository. He spent three years in Boston working on a lexicon of scriptural Greek. Illness caused him to move to New York City. He was appointed as professor of biblical literature at Union Theological Seminary, serving from 1837 until his death. Robinson's arch, on the south-western flank of the Temple Mount, once supported a staircase which led to the temple. In 1836 Robinson published both a translation of Wilhelm Gesenius' Hebrew Lexicon and a Greek New Testament Lexicon. Robinson traveled to Palestine in 1838 in the company of Rev. Eli Smith. He published Biblical Researches in Palestine in 1841, for which he was awarded the Gold Medal of the Royal Geographical Society in 1842. He was elected a Fellow of the American Academy of Arts and Sciences in 1847. Robinson, together with Smith, made scores of identifications of ancient places referred to the Bible. His work established his enduring reputation as a "Founder" of Biblical archeology, and influenced much of future archaeological field work. 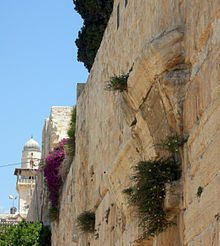 Examples of his finds in Jerusalem include the Siloam tunnel and Robinson's Arch in the Old City; the latter was named in his honor. Greek and English Lexicon of the New Testament (1836; last revision, New York, 1850), based on the Clavis Philologica Novi Testamenti of Christian A. Wahl. This work superseded his translation of Wahl's work, becoming a standard authority in the United States. It was several times reprinted in Great Britain. Memoir of Rev. William Robinson, with some Account of his Ancestors in this Country (printed privately, New York, 1859) This is a sketch of his father, who for 41 years was pastor of the Congregational church in Southington, Connecticut. Physical Geography of the Holy Land (New York and London, 1865). This is a supplement to his Biblical Researches, and was edited by Mrs. Robinson after his death. Revised editions of the Greek and English Harmonies, edited by Matthew B. Riddle, were published in 1885 and 1886 after Robinson's death. Wikimedia Commons has media related to Edward Robinson. ^ a b c James B. Pritchard (1958). Archeology and the Old Testament. Princeton, New Jersey: Princeton University Press. pp. 57–58. LCCN 58010053. ^ a b c Wilson, J. G.; Fiske, J., eds. (1900). "Robinson, Edward" . Appletons' Cyclopædia of American Biography. New York: D. Appleton. ^ Rines, George Edwin, ed. (1920). "Robinson, Edward (scholar)" . Encyclopedia Americana. ^ Quoted in T.W. Davis (2004). Shifting Sands: The Rise and Fall of Biblical Archaeology, Oxford and NY: Oxford University Press. p. 102. "The Development of Palestine Exploration: Being the Ely Lectures for 1903", Frederick Jones Bliss. (London,1906), Lecture V "Edward Robinson" pp. 184 ff. Williams, Jay G. The Times and Life of Edward Robinson: Connecticut Yankee in King Solomons Court. Atlanta: Society of Biblical Literature, 1999. This page was last edited on 16 October 2018, at 05:18 (UTC).